This Presentation date is April 4, 2018 at 15:30-17:30 local time. Leo Leung, Product Management, gives a quick overview on Oracle Cloud, their strategy, and why Oracle is building its own infrastructure services. Pradeep Vincent, Architect, dives into the architecture of Oracle Cloud Infrastructure, and some of the key design decisions and differentiators. 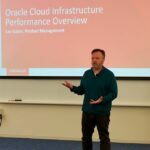 Lee Gates, Performance Engineering, looks at Oracle Cloud Infrastructure’s performance methodology, and why performance matters to customers, through benchmarks and demos. Shan Gupta, Solutions Architect, learns about the key capabilities of Oracle’s Database Cloud Service with an overview and demos. Karan Batta, Product Manager, shows how Oracle addresses HP and performance-oriented customers with on-demand compute, storage, and software technologies.